The Duke of Longville, in need of an heir, is about to take a second wife-a sturdy young widow who followed the drum during Britain's campaigns on the Peninsula and has proved her fertility by producing a child. But two weeks before the wedding, his long-estranged daughter arrives on his doorstep with a shocking announcement that tumbles all their lives into confusion. The widowed Lady Eugenia Wharton, almost as strong-willed as her betrothed, has no illusions about why the Duke of Longville wishes to marry her. Unfortunately, that has not kept her from falling in love with him. Their future is destined for some memorable clashes, as she challenges his conviction that he is always right. The duke's daughter, Lady Caroline Carlington, has been raised in a home with egalitarian leanings. She does not want to make her come-out in London society, she does not approve of the ton, and she most particularly does not want a step-mother. And then one night in the duke's bookroom, she meets exactly the type of useless nobleman she most abhors, a charming fribble named Anthony Norville. Caroline is startled by a sudden, if reluctant, attraction-until she discovers he is the brother of the woman who is about to become her despised step-mother. Which would make Tony Norville her uncle! Anthony Norville, Viscount Frayne, is heir to an earldom. Resenting his father keeping him from the fight against Napoleon, he has retreated behind a façade of airy charm. Until he is caught in the conflict between Lady Caroline and his sister, and the side effects of the war reach London, forcing him to discover new depths within himself. It takes riot, ransom, and considerable mental readjustment before both pairs of Regency lovers are reconciled against the unrest in London at the time of Waterloo. 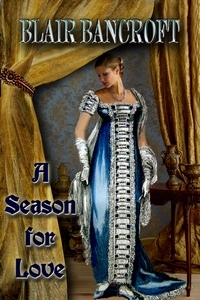 "In a delightful dance worthy of any Regency Ball, Ms. Bancroft interweaves her characters into one fresh and cohesive romance, letting each find their desires in an effortlessly smooth narrative. . . . Blair Bancroft has captured the regency and has a firm grasp on its nuances and idiosyncrasies."